Crafting paper flowers is always fun! This tutorial features the flower called Anemone. The name Anemone has its origins in the Greek language and means windflower. The ancient Greeks believed that the wind blew the petals open and carried away the flower petals after it had died. Whatever the origin of the name, the flower is naturally beautiful, and brides often use them for their wedding decor. The paper versions of these blossoms last much longer than the real thing, never fade or die and always look nice. 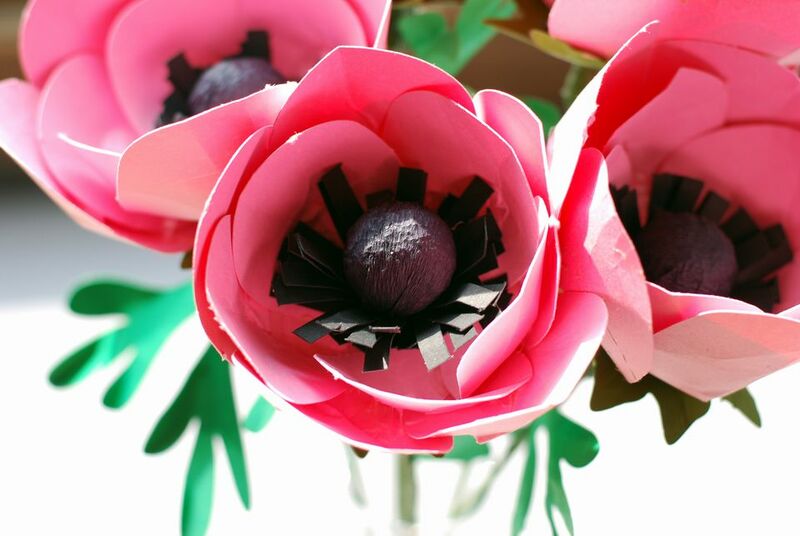 Make some paper flowers for your home and enjoy them for a long time to come. Poke a hole into the Styrofoam ball with the wooden dowel or skewer. Insert a bit of hot glue into the hole. Place dowel or skewer into the hole and let dry until secure. Download the template files and cut flower parts using the photo above as a reference guide. Use the pdf file to print on cardstock if you are planning cut out the flower parts by hand. Files for most digital die cutters (SVG, ai, eps, pdf, wpc, and DXF) are included in the download. Cut a 3.5 inch by 3.5 inch square from black crepe paper. Place the black crepe paper square onto the Styrofoam ball and wrap around the ball. Secure the crepe paper to the dowel with floral tape. Wrap the black cardstock fringed square around the Styrofoam ball as in the photo above. The black fringe represents the anther and filament of the anemone. Secure the cardstock fringe to the ball and dowel with hot glue. Wrap the bottom of the fringed square and top of the dowel with floral tape. There are five broad petals and five small petals per flower. Overlap the bottom edges of each petal and secure with hot glue forming a cupped shaped petal. Allow the hot glue to dry before executing the next step. Press the pointed part of the cupped petal inward being careful not to tear the petal. Bend the edges of the petal gently back and forth to give it realism. Attach the five smaller petals evenly around the crepe paper wrapped Styrofoam ball with hot glue. Attach the five larger petals evenly around the flower head with hot glue. Pull the green floral sepal over the dowel and attach with hot glue to the bottom of the flower head. Wrap the entire stem with floral with green floral tape. Attach the leaf to the stem with hot glue. Wrap the base of the stem with green floral tape. Place one or more paper Anemones into a vase and admire your beautiful arrangement. Tip: Italian crepe paper can be substituted for cardstock. Italian crepe paper produces delicate petals and will give the paper flower realism. If you do choose to use crepe paper, you will have to cut everything by hand as crepe paper is not suitable for a digital die cutter.